Many 8-bit computers had video systems that provided tiles, and when these were available, they were the obvious ways to display text. However, some 8-bit computers such as the ZX Spectrum and Amstrad CPC, only had bitmap displays. If you are using a bitmap anyway, the possibility arises of using a proportional font. Sure, it would be a bit slower to render text, but for many purposes, surely worth it. Yet all the 8-bit programs I can find, still used a fixed width font. Were there any 8-bit programs (other than font demos) that used a proportional font? 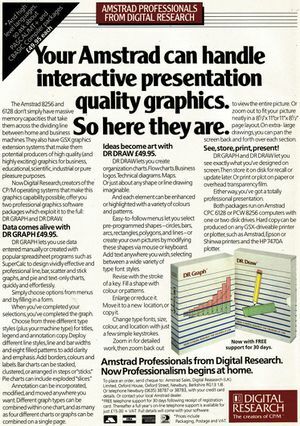 Digital Research produced as one of their early attempts into graphical desktops (on their way to GEM) a basic portable graphics library - GSX. 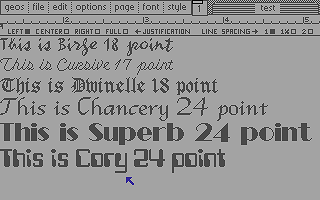 GSX did actually support proportional fonts, both in print and on-screen, and was included with the CP/M support in Amstrad machines running CP/M Plus. GSX was supported by two of DR's own applications, DR Draw and DR Graph that were available for the range of enhanced Amstrad machines (CPC6128, PCW), although at a pretty high price. So, this is definitively "out-of-the-box" support for proportional fonts, both in applications and a system-wide extension. You couldn't really use a proportional font on the Spectrum because the colour attributes were one background and one foreground for each 8x8 square. That meant that, practically speaking, each letter had to be by itself in an 8x8 cell. With the reasonable limit of every word of its own color, it is quite possible though. Just have the space between words wide enough to absorb attributes boundary or place color change in those spaces that do absorb the boundary. The previous example also shows that. Note: Commodore 64 also has the bitmap mode very close to the one ZX Spectrum has. It is exactly that mode shown in the link above. 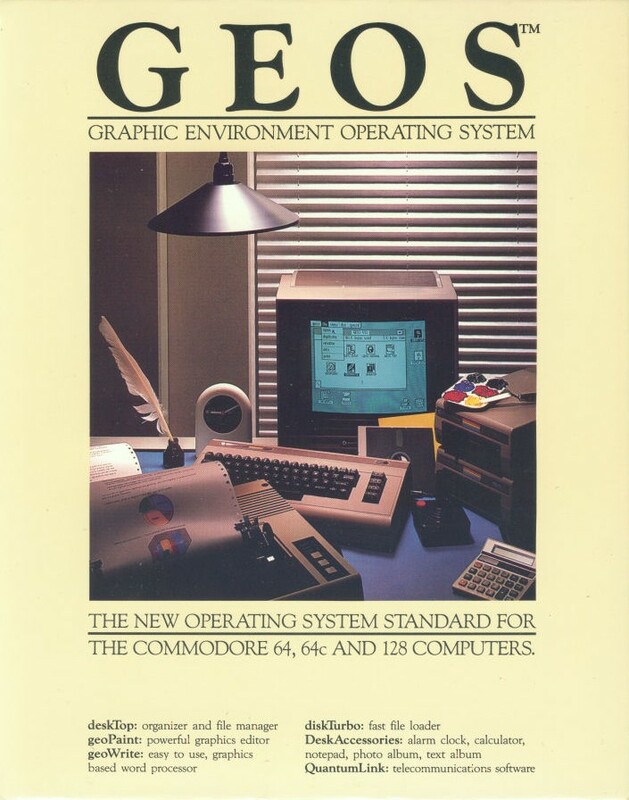 Back in 1986, a company called Berkeley Softworks released a GUI desktop environment called GEOS for the Commodore 64. It was later ported to the Commodore 128, the Commodore Plus/4, and Apple II. GEOS was obviously inspired by the classic Mac OS desktop. It implements all the basic elements one would expect from such environment, such as a pointer-driven UI with icons, windows, pull-down menus, a shared clipboard, and – yes – proportional fonts of many sizes, families and styles. GEOS came bundled with geoWrite (a word processing application) and geoPaint (a paint program), and a number of utility programs, all of which used the font engine provided by the OS. No 8-bit computer (back then) did support proportional fonts out of the box, but there where some programs on next every bitmap capable 8 bit computer, I this might as well include the Spectrum. For the Apple II support was added by Apple rather early. Already the Apple DOS Toolkit included a utility called HRCG or High Resolution Character Generator, which moved character drawing onto highres bitmap and into software (*1). While, AFAIR, it originally only supported fixed spacing fonts, soon other programs used this to display at least part of their output in proportional. When the Apple II Mouse was introduced, first for the IIc and later the basic II, it came with MousePaint, a MacPint clone for the Apple II using proportional text on screen and in menus (*2). The availability of a mouse also triggered a lot of other programs trying to do what the Mac showed on an Apple II. Most notably maybe MultiScribe for the II (*3) and MouseDesk. Anotehr example for add on software enabeling proportional fonts would be DR's GSX, the grapic extension (*4) for CP/M and and adapted to several Z80 machines like Amstrads CPC or Commodores 128. It was as well the core component for GEM on the Atari ST and PC. And then there was GEOS. It enabled C64 programs to use proportional text and exchangeable fonts. Soon also ported to the Apple II. So, bottom line: No, it hasn't been used out of the box, but later tools added this capability to 8-bit computers. *1 – It was slow (compared to textmode) it ate up memory, but it was also AWESOME. *2 – Not to be confused with MouseText, a character set change for the Apple IIc and Enhanced IIe introducing some graphic elements into the character set, allowing character based software displaying a simplified GUI. Funny part here, soon programms used HRCG with Mousetext to draw the same elements using the graphics characters, but also add other graphic elements. *3 – Which got a second life as BeagleWrite after their company was bought by Apple and integrated into Claris. *4 - It was way more than just an average graphics library. Beside being made to the GKS standard, it also includes features for multiprogramming and windowing. The games Skool Daze and Back To Skool used proportional fonts for text on the ZX Spectrum. Bearing in mind that a separate version of the shifting code would be needed for each of the eight different amounts by which bytes would need to be shifted, it should be clear that bit shifting graphics will be much more time consuming than showing bit-aligned times. Not the answer you're looking for? Browse other questions tagged display text font or ask your own question.